Game of Thrones is back! The much-awaited season 7, promising widespread death and destruction, is off to a cracker of a first episode. Will we see a face-off between Drogon and the Night King? Hordes of zombies against fire-breathing dragons and the raw savagery of the Dothraki and the Unsullied? What fate awaits our beloved Jon Snow and Starks and Khaleesi? What devious plot will the ruthless Cersei come up with? The bugles of the great war have been blown and we can only wait with bated breath at what unfolds next. Meanwhile, here is a recap of 6 ominous moments from the first episode that give you enough fodder to spam Reddit with the next fan theory. Episode 1, called Dragonstone, kicks off in the most Game-of-Throne-sque way. Arya Stark, fresh from killing Walder Frey and his two sons, now impersonates the old Walder himself and poisons the entire freaking extended family of the Freys. “Winter has come for House Frey and the North remembers”. Leave one Stark wolf alive and it will devour you whole. Arya Stark has established herself as a master assassin and it seems nothing can stop her from carrying out her kill list. More importantly, she states in deadpan-facetious manner to a group of young soldiers (the scene includes a strange and mediocre cameo by an out-of-sorts Ed Sheeran) that she is headed to King’s Landing to kill the queen. Though the group laughs out loud at the absurdity of such a possibility, we all know what Arya is capable of. Is this foreshadowing of Cersei’s inevitable demise, even though the treatment of the situation is casual with sinister undertones? We will have to wait for that. The only person whom I consider to be the devil’s incarnate in Westeros is Peter Baelish aka Littlefinger. By now, it is clear that he does not give a fig about any person in the seven kingdoms and will resort to every trickery and deceit to seize the vantage position in any situation. 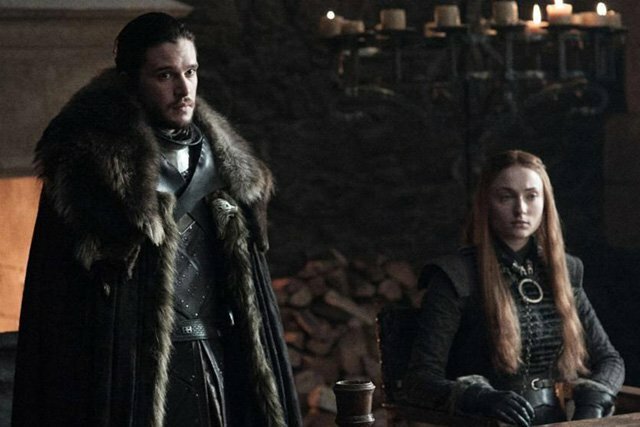 When he observes a palpable tension between Jon Snow and Sansa Stark over their difference of opinion, he subtly hints at Sansa what she might want. Now, if we had the Sansa of some of the previous seasons, she would have undoubtedly fallen prey to the devilish whisperings of Littlefinger. But we have a reborn Sansa now, tough as nails, discerning of every situation. She seems to be acutely aware of the treachery that Baelish is capable of and this is reflected in her curt responses. However, she is also more assertive than before and has some hidden admiration for Cersei Lannister. “I learnt a lot from her”. Let’s just hope better sense prevails, instead of Littlefinger, as the show progresses. It is mandatory for Game of Thrones to have an outright despicable character whom you can hate without any qualms. Earlier it was Joffrey, then Ramsay and now it is Euron Greyjoy, the traitorous uncle of Yara and Theon Greyjoy. A meeting is set with Cersei where he has the impudence to ask for her hand in return for the Iron fleet. Cersei sensibly refuses, stating that he is not trustworthy, to which Euron replies that he will be back with a gift that would delight her. Knowing the bloodlust that Cersei has, it is quite possible that we might soon see the severed head of one of the characters being giftwrapped in one of the future episodes. Let’s hope it turns out to be something else. Are we talking about Tyrion vs Cersei? Or maybe Tyrion vs Jaime? Nope! If you recall the first meeting that Cersei has with her brother and incestuous lover, their exchange was dripping with tension and distrust. Cersei asks Jaime “Are you afraid of me”? Jaime, looking a bit rattled but resolute as ever tells her that they never got around to talking about what happened to Tommen. Now the deal here is that Cersei is certainly damaged beyond repair and even the death of her three children hasn’t affected her one bit. She might make one disastrous decision after another in the wake of a growing onslaught from all possible sides and some choices may be a recipe for sure disaster. In that case, the onus might fall on Jaime to be the queenslayer this time for the greater good of King’s Landing and its people. One of the most interesting moments in the first episode was the scene involving The Hound and The Brotherhood Without Banners- the fire worshipping outlaw group led by the intriguing Beric Dondarrion. Sandor Clegane is ever cynical, dismissive and foul-mouthed towards the brotherhood and is always doubtful of their motives. However, there is a scene where Thoros asks him to look into the fire and tell them what he sees. It is a moment of clarity for us viewers as we become aware that Clegane might have a much larger role to play than merely be a sidekick to Dondarrion, for it is probably his vision in the flames of the white walkers and the Night King walking along that is shown at the start of the episode. What future awaits The Hound? Let’s see how it pans out. This was an obvious one but Sam Tarly reading about Dragonstone and the mountain of dragonglass seems to be a sure indicator that the Targaryens- Jon Snow and Daenerys, are sure to enter into a collaboration sooner or later. Poor Snow doesn’t even know yet that he is a Targaryen, though. He really knows nothing. But what would actually happen when the two unite? Will a power struggle break out? 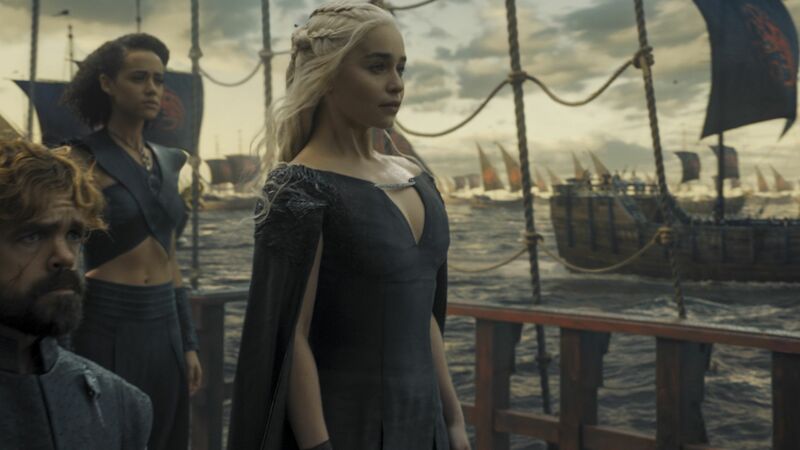 Daenerys has really worked hard in collecting an army and a fleet to renege on her self-promise. How Jon Snow and the Starks will work out that dynamic will make for some really interesting viewing. I am clinging to the hope that there is inherent goodness in all our favorite characters and the best thing would be that they unite together to defeat the impending evil.